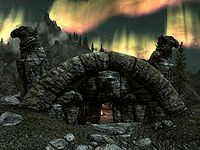 Four Skull Lookout is a small Nordic ruin located between Karthwasten and Red Eagle Redoubt, east of Blind Cliff Cave, containing bandits. The easiest approach is from the Red Eagle Redoubt lower camp (before the ascent). It is one of the three ruins that you have to visit for the Destruction Ritual Spell quest. If the Divine Crusader Creation is installed, two Bandit Thief enemies can be found here. They are in possession of the Crusader's Relics. The ruin consists of a single room with open doorways to the northwest and southeast. It contains a single unlocked chest containing leveled loot next to a campfire, with a searchable pot hanging over it and two unowned bed rolls around it. Next to one of these is an iron sword and shield. Outside, in front of the northwestern doorway is a pedestal, with a chair off to the left. It is the home of three bandits, a warrior, archer and wizard. There are three juniper trees around the ruin, and a bird's nest containing a pine thrush egg lodged against the southwestern side of the ruin. One hanging moss plant can be found to the left of the southeastern doorway. Nearby is a leveled animal that may get drawn into any battle with the bandits. Directly heading west from the ruin towards the cliff, on a promontory, a shrine of Zenithar can be found along with minor loot including a pickaxe, a couple of rolls of paper, loose coins and a small coin purse. A silver ore vein can be found among the rocks just in front of the pedestal. This page was last modified on 23 February 2018, at 22:46.